Despite being a relatively new contender in the smartphone market, the Huawei P20 Series has surpassed the 6 millionth-mark of worldwide sales recently. In a statement, Huawei said that hitting 6 million units of the P20 Series sold imposes a sales growth of more than 81 percent better than the P10 series’ sales in 2017. The Huawei P20 Series is comprised of the P20 Pro, P20, and the P20 Lite. The said flagship series received an overwhelming hype from users because of the P20 Pro’s triple rear camera setup capable of producing decent photos even in a 10x zoom setting. 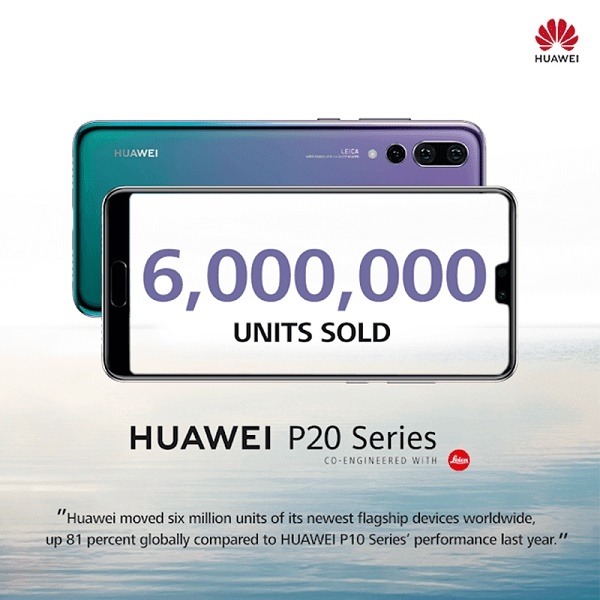 During its local launch, the Huawei P20 series recorded PhP 100,000,000 of sales in the first 5 hours. The Huawei P20 Series is priced at PhP 44,990 for the P20 Pro, PhP 34,990 for the P20, and PhP 15,990 for the P20 Lite.